This past weekend, Mother Nature set us up with a winter wonderland scene for Christmas week, with over 16 inches of snow. 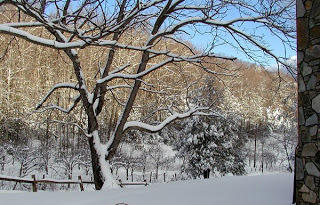 Above is a photo taken December 19, looking past our driveway, down to our orchard across the road (the snow giving us a temporary and appreciated break in pruning the remainder of our apple trees). We had a wonderful couple, Dave and Claudia, staying with us over the weekend who were celebrating their 38th anniversary. We spent two evenings having dinner and great conversations with Dave and Claudia before they headed home on Sunday. And Guest Dave insisted on lending a hand to Innkeeper Dave with shoveling the drive on Saturday, which was awesome. Thanks, Dave! 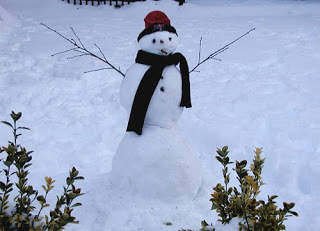 We hope that everyone affected by the snow has been having a good week. The temperatures have been fairly warm and the skies sunny, so the roads are clear and the snow is melting, but there’s still plenty of the white stuff around for everyone’s enjoyment. Biltmore Estate will be open December 24, until 4pm, and from 10:30am until 3pm on Christmas Day. There will be no Christmas Candlelight Evening tours those days. Keep in mind, we have two-day tickets for the price of one day’s admission with an additional $10 discount of the gated ticket price. White Horse Black Mountain in downtown Black Mountain will be holding a free Christmas Eve concert from 6pm to 8pm featuring the debut of The Wildnerness Act and performances by White Horse’s talented owners, Bob Hinkle and Kim Hughes. The gingerbread houses that were part of the National Gingerbread House Competition display at the Grove Park Inn in Asheville left to make an appearance on ABC’s Good Morning America on December 24. The houses will return to Grove Park Inn for public viewing on the afternoon of December 28. The display runs until January 3. This entry was posted in Uncategorized and tagged Asheville, Biltmore, Black Mountain, festivals and special events, food and drink, Winter by Inn on Mill Creek. Bookmark the permalink.